Zebra QL220 - Direct thermal, linered platen, 203 dpi, 4 ips, 1.89" print width, cable ready, LCD, 1MB SRAM, 1MB flash. Includes battery, belt clip & user's manual. Order battery charger & cables separately. See accessories. Power supply (Part# CC16614-G4) not included. See accessories. 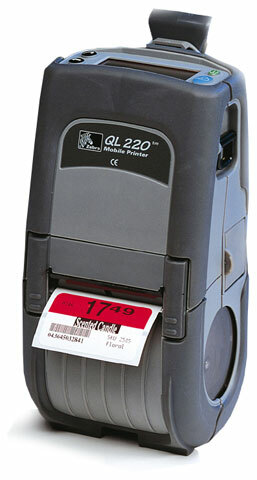 The QL220 direct thermal mobile printer has been designed with the most advanced technology in rubberized over-molding to maintain both rugged construction and minimal weight. With center-loading media, smart battery monitoring and an optional LCD, it provides user-friendly options to keep your business moving. All units ship with one user's manual. The Zebra Q2A-LU1AV000-00 is also known as ZEB-Q2ALU1AV00000	or Q2ALU1AV00000	.